"Reliance, Illinois has it all—mystery, politics, war; love, death, and art. Every page is a pleasure." Illinois, 1874: With a birthmark covering half her face, thirteen-year-old Madelyn Branch is accustomed to cold and awkward greetings, and expects no less in the struggling town of Reliance. After all, her mother, Rebecca, was careful not to mention a daughter in the Matrimonial Times ad that brought them there. When Rebecca weds, Madelyn poses as her mother’s younger sister and earns a grudging berth in her new house. Deeply injured by her mother’s deceptions, Madelyn soon leaves to enter the service of Miss Rose Werner, prodigal daughter of the town’s founder. Miss Rose is a suffragette and purveyor of black market birth control who sees in Madelyn a project and potential acolyte. Madelyn, though, wants to feel beautiful and loved, and she pins her hopes on William Stark, a young photographer and haunted Civil War veteran. Mary Volmer was born in Grass Valley, California, and now lives in the San Francisco Bay Area. She earned an MFA in Creative Writing from Saint Mary’s College and a master’s degree from the University of Wales, Aberystwyth, where she was a Rotary Ambassadorial Scholar. She has been awarded residencies at the Vermont Studio Center and Hedgebrook and now teaches at Saint Mary’s College. She is also the author of Crown of Dust. Reliance, Illinois is her second novel. "Reliance, Illinois has it all—mystery, politics, war; love, death, and art. In finely wrought sentences, Volmer's novel follows such a lively cast of characters, first and foremost her marvelous protagonist Madelyn. Every page is a pleasure." "Female protagonists in author Mary Volmer's historical fiction novels are resilient, educated, street smart, intrepid. [Reliance, Illinois] harbors unexpected twists." 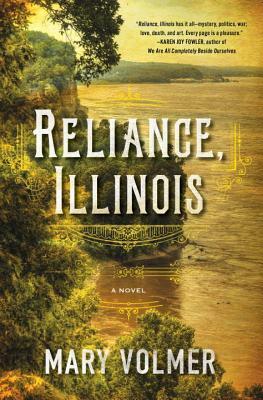 "Volmer's unforgettable protagonist lives through social evolution, the fight for women's rights and personal strife, yet she perseveres, and Reliance, Illinois, with its universal themes and evocative period detail, is uplifting." "Complete with love, war, death and mystery, the story’s characters weave their way through social evolution, gossip, crime, women’s rights movements and their own personal struggles." "Volmer’s second novel paints a compelling portrait of a small Midwestern town and its residents during a period of great change." "[Reliance, Illinois] has smart touches of humor and is well grounded in its place and time. This novel will appeal to readers curious about the lives of women in the post-Civil War Midwest." "Volmer’s second novel will appeal to readers for its rich cast of characters and well-evoked setting." "A genuine pleasure. Reliance, Illinois is lively, witty, and evocative, with characters who pop off the page and a protagonist you'll never forget." "Mary Volmer’s Reliance, Illinois grabbed me from the first page. Staggeringly beautiful prose, a poignant story, the whip smart heroine Maddy who I rooted for all the way. Volmer brings a universal theme of the reliance—all of us who search for it—to be found in ourselves. Do yourself a favor, clear your schedule and drink in Volmer’s radiant Reliance, Illinois." "Mary Volmer’s lush prose draws the reader into an intricately detailed world." "In Reliance, Illinois, Mary Volmer creates a world at once old and new. She evokes an entire time and place through the perfect application of richly enlivening historical detail. In her depiction of the varied and often risky recourses her characters adopt in order to live well or with dignity—or at all, Volmer tells a compelling, timeless story about exigency and survival, especially for women. A deftly written page-turner that addresses universal questions with open-heartedness and verve, Reliance, Illinois offers a captivating read about an important juncture in American history." "There are subliminal echoes of L. Frank Baum in Volmer's mythmaking . . . But Volmer keeps whimsy in check with a terse present-tense voice that invests her pioneers piquant inner lives and a poker-faced lyricism." "Any illusions about the glamour of digging for gold are totally shattered by Mary Volmer's Crown of Dust, a grim and carefully researched book about the California gold rush . . . Volmer, in her remarkable first novel, has recreated the reality of an era that few can even visualize now." "Volmer's distinctive, beautifully written debut is set in the California gold rush country in the mid-19th century . . . [Her] prose is taut and restrained, moving the story along at a healthy clip as her hardscrabble characters rumble and stumble through their dusty domain. Volmer's found a fat vein of gold in some heavily mined territory." "Volmer paints a moving portrait of outcasts and nonconformists who build their own community . . . Evocative historical background and thoughtful social observation make this a promising debut."